Dr. Jeremy Groll is an expert in reproductive endocrinology and fertility treatment. Fertility Foods presents his groundbreaking, noninvasive, nutritionally based method, which increases ovulation, reduces miscarriage, and significantly improves your chances of successfully getting and staying pregnant. Dr. Groll’s specialized research has proven that there is a powerful link between a body’s insulin resistance and fertility problems. Resistance to insulin increases the body’s insulin levels, hindering normal ovulation either by limiting the maturation process of the released egg or by preventing ovulation altogether. High insulin levels can also impede the fertilized egg’s ability to attach to the uterus, leading to implantation failure and miscarriage. In fact, women with insulin resistance problems are four to five times as likely as other women to suffer miscarriages — meaning they have as high as a 50 percent chance of miscarriage. Dr. Groll has developed an insulin-reducing diet based on balancing protein and complex carbohydrate intake to create insulin levels most conducive to ovulation. He combines his nutritional plan — which includes nutritional charts, food suggestions, and recipes — with a specific exercise program that enhances insulin metabolism and an emotional support system that you can draw on during your quest to become parents. This three-pronged approach increases the rates of spontaneous ovulation and significantly improves the uterine environment, decreasing the potential for miscarriage. One in every ten couples in America is affected by infertility. Yet, only 5 to 10 percent of patients actually need high-tech procedures such as in vitro fertilization. 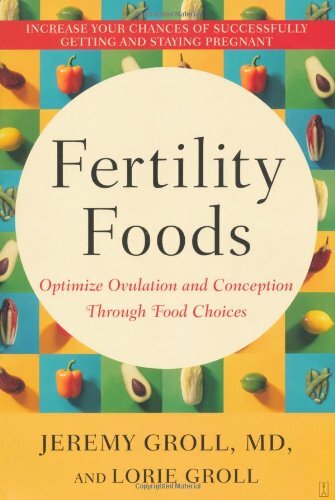 Whether you are taking your first steps in combating infertility or searching for effective methods to support more advanced fertility treatments, Fertility Foods is your helpful and rewarding guide.